The Holiday season is when we spend the most time with my grandmother’s recipe cards, which are now fraying and fading with time, a little more stained with each holiday. 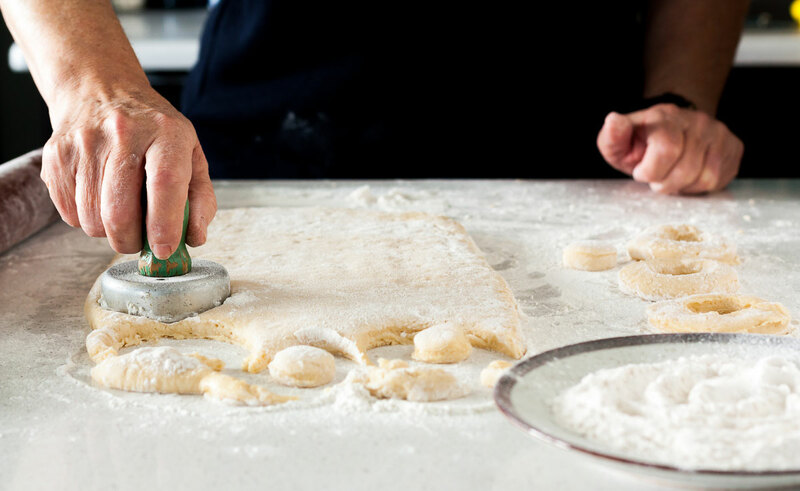 Year after year, we refer back to those recipes and we make the same cakes and cookies that my grandmother used to make every holiday, years ago. So, even though I didn’t get the chance to really get to know my grandmother well, I feel like I got to know her a little bit through her handwriting and her recipes, recipes which she passed onto my mother who has lovingly filed them away in her recipe box for safe-keeping. 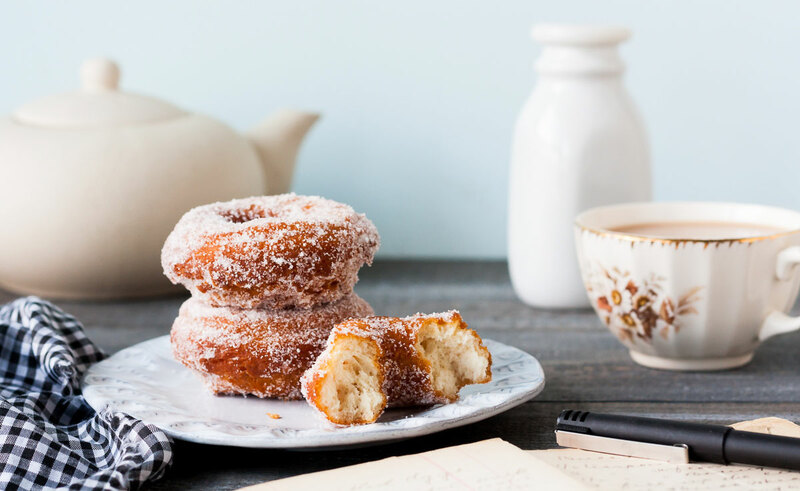 These doughnuts are one of those hand-written recipes that we cherish from my grandmother. She made these doughnuts for the holidays. They are very simple to make and the recipe makes an old-fashioned doughnut that has a delightfully crisp exterior. In a large bowl, whisk together the eggs and the granulated sugar. Add the vanilla extract, melted shortening and milk, and whisk until combined. In a separate bowl, whisk the flour with the ginger and baking powder. Pour this mixture of dry ingredients into the bowl with the wet ingredients, and mix everything together with a wooden spoon to form the dough. Cover the bowl with plastic wrap and refrigerate the dough for one hour. Roll out the doughnut dough on a lightly floured surface to ½–¾-inch thickness, then cut out doughnuts with a 2¼-inch doughnut cutter. Re-roll the scraps until you have used up all the dough. Preheat the canola oil to 350ºF (180º) in a big pot or deep fryer. Fry the doughnuts, four at a time, for approximately 4 minutes, flipping them after 2 minutes with the help of a fork. They should be a dark golden brown. 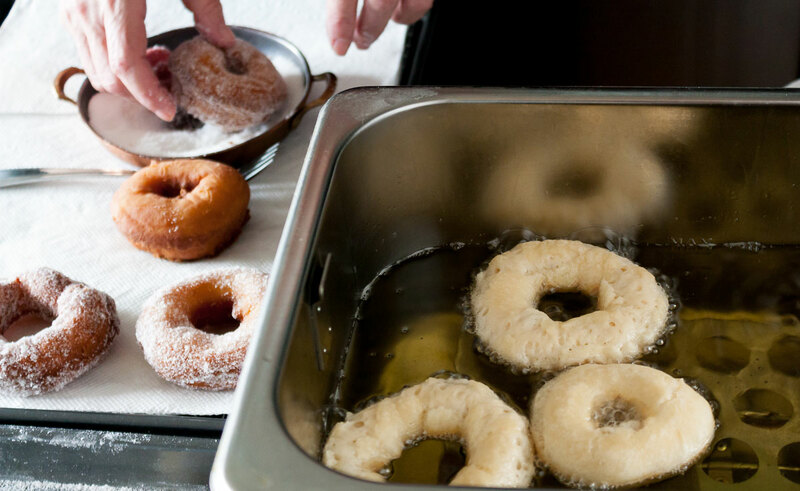 Remove the doughnuts from the fryer and place on a baking sheet lined with a few layers of paper towel to soak up any excess oil. Dip the fried doughnuts in granulated sugar to coat. Doughnuts are best eaten the day they are made.